Kayakers paddling the Missouri River from source to mouth find South Dakotans willing and eager to help. Photo by Jessica Giard. Each spring, South Dakotans who live along the Missouri River become friends to adventure hunters attempting to paddle the entire river, starting in Montana at the source and continuing to St. Louis (or sometimes all the way to the Gulf of Mexico). The trip has allure because the Missouri is the longest river in North America at 2,341 miles. After all, would you train to scale a mountain and then fly to Alaska to climb something other than Denali? 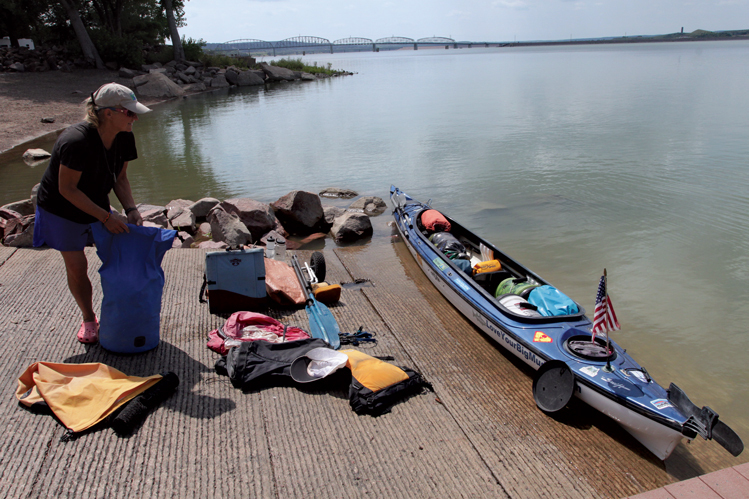 As paddlers descend the 500 river miles in South Dakota, they experience some of the Missouri’s most dynamic contrasts. On the state's northern border, they're on the inland sea that is Oahe, the “Big Bear,” whose winds can make travel impossible. Lakes Sharpe, Francis Case and Lewis & Clark aren't much easier. Luckily the state's long river stretches provide a reprieve, since hundreds of miles still lie ahead for them. Janet Moreland paddled the Missouri River from Montana to the Gulf of Mexico, the first woman to complete the 3,800-mile water journey. Photo by Jessica Giard. Moreland was the first woman and first American to finish the source to sea trip. She started May 1, 2012, and completed her descent to the Gulf of Mexico the following December. 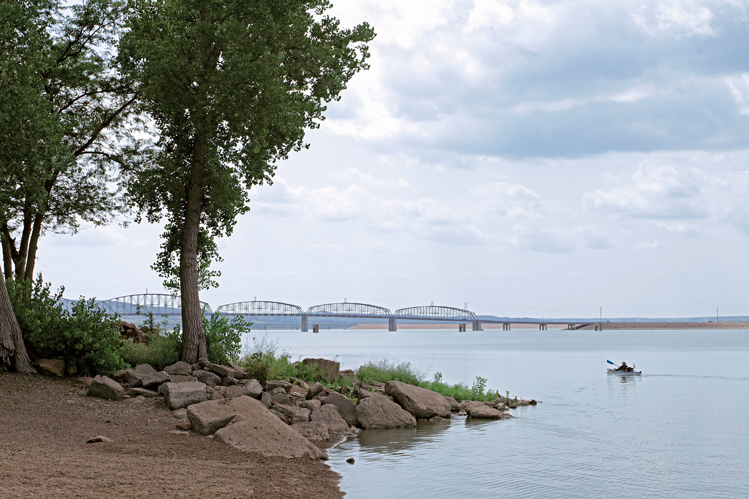 Social media — especially a Facebook page called Missouri River Paddlers — has made a huge difference for water travelers and for South Dakotans willing to help them around a dam, or offer a place to sleep or a hot meal. Pat Wellner, a kayak racer from Pierre, thinks the uptick in paddlers doing the trip is noteworthy, but that the Facebook page, created by paddling enthusiast Norman Miller of Livingston, Mont., has made a big difference in spreading the word. “The first time I met someone doing the trip was in 2009, and now you can keep track of the river travelers thanks to Norm's page,” Wellner says. “I guess my motivation to help is our common interests: paddling and the river. It's fun for me to see how they've prepared, the boats and paddles they use, the stay-dry equipment.” He also warns paddlers that the Big Bend area is tricky and that they have plenty of wind and big water yet to come. Wellner also appreciates the motivation behind the trips. He met Dom Liboiron, a freelance writer who would paddle, stop to work, and then return to paddling. Liboiron dedicated his 2012-13 Montana to New Orleans trip to his late uncle, Mitch, and to raise awareness for heart disease. He learned to appreciate Canadian Rod Wellington's “no mechanical assistance” approach. 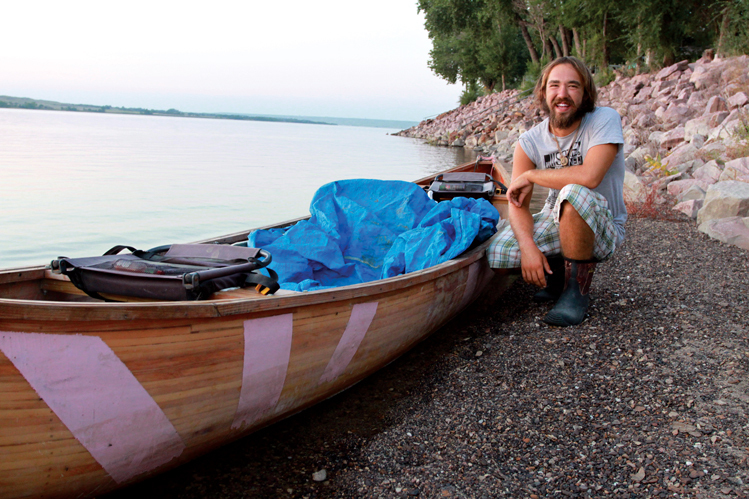 Wellington manhandled all his gear and kayak around each of South Dakota's four dams. “What they do is tough, especially in terms of time. Finding that much time off, and the money to cover such a trip, is not easy, and that's why it seems to be college kids or retirees doing the whole stretch,” he says. “There are so many fitness levels. Some are doing it aggressively and others are going at their own pace.” Wellner says many of the paddlers are engaged in “ninja camping” where they alight along any bank or slice of shore available to them. Shawn Hollingsworth paddled the Missouri River in a homemade pine canoe featuring pink ribbons for breast cancer research. Photo by Rod Wellington. Giard's most memorable experience with source-down travelers came when she joined a group of British adventurers for several days on the water. She says river-lovers quickly find common ground. While most kayakers would never dream of replicating the source-down journey, there's a transitive property to the face-to-face experience. Wayne Nelson-Stastny is a U.S. Fish & Wildlife Service scientist, a Wagner native, and a huge proponent of the source-down travelers he's met. In Yankton, his family hosted Moreland and helped her depart onto the first truly moving water she'd paddled in months.